Advice > Garage Floor Makeover! Garage floors take a battering from constant vehicle and foot traffic, spills and stains, dust, grease and dirt. But with a bit of effort and the right quality product from a PaintRight store, they can be rejuvenated and given a new lease of life. 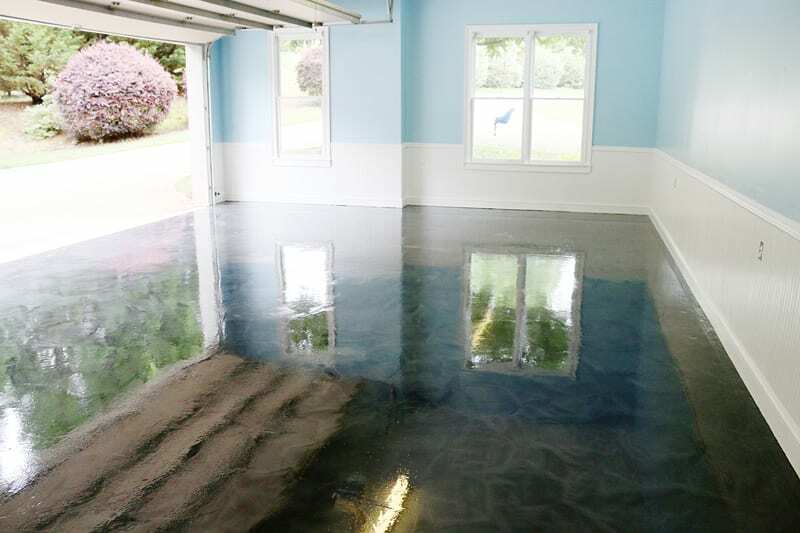 Rust-Oleum’s RockSolid Polycuramine floor coatings give garage floors a makeover, offering unparalleled durability that protects them from just about any sort of treatment you care to dish out. Polycuramine is 20 times stronger than epoxy. It’s impervious to chemicals like salt, oil and gas. It’s low-odour, eco-friendly and lasts a lifetime. The extreme high-gloss finish looks great and is easy to maintain. For a great decorative look, use the RockSolid Polycuramine Garage Floor coating, which, like all RockSolid finishes, comes in a kit. A kit contains a Polycuramine pre-tinted burst pouch, decorative colour chips, a foam roller, concrete etch, instructions and DVD. 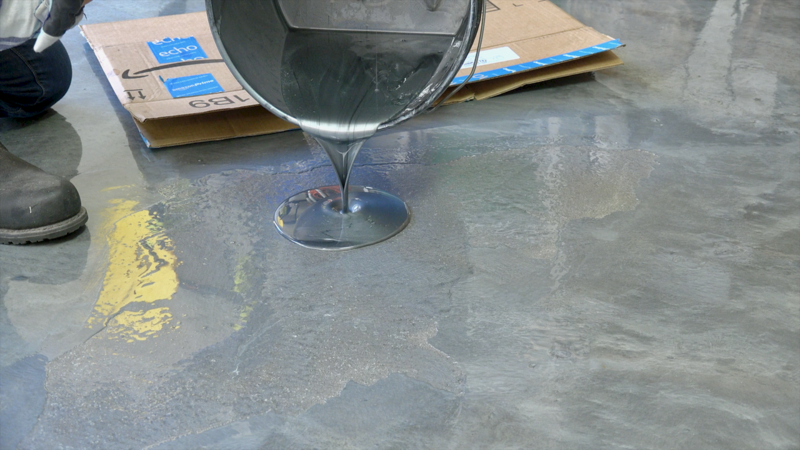 If you want to go to the next level and have a garage floor that’s the envy of your street, use a RockSolid Polycuramine Metallic Floor coating kit. Metallic floor coating contains pearlescent and indescent accents that give your floor a stunning glossy marbleised finish. Your friends and neighbours won’t believe it! The kit contains a Polycuramine burst pouch, metallic tint, polyamide roller, stir stick, instructions and a DVD. But if you want a more conventional non-decorative look, use a Polycuramine Clear Top coat kit, which contains the clear burst pouch, anti-slip additive, instructions, a nap roller and DVD. Once you’ve cleared your garage floor, removed stains and heavy soiling with a heavy-duty degreaser, application of Rust-Oleum Polycuramine coatings is relatively straightforward. Whichever finish you opt for, follow the instructions for mixing the components contained within the kit and then apply using the applicator provided. Standard one-car kits provide coverage of 23 square metres. A great feature of RockSolid floor coatings is that they require only around 8 to 10 hours drying before you can walk on the floor. Longer drying of around 24 to 36 hours is required before vehicles can be driven on them. With an optimum application temperature of between 4 and 32 degrees Celsius, drying times can vary according to ambient conditions. You spend money, time and effort to keep the surfaces of both interior and exterior floors, walls, ceilings and roofs protected from the elements – why let your garage bring down the tone? Visit your nearest PaintRight store and ask about Rust-Oleum garage floor products. 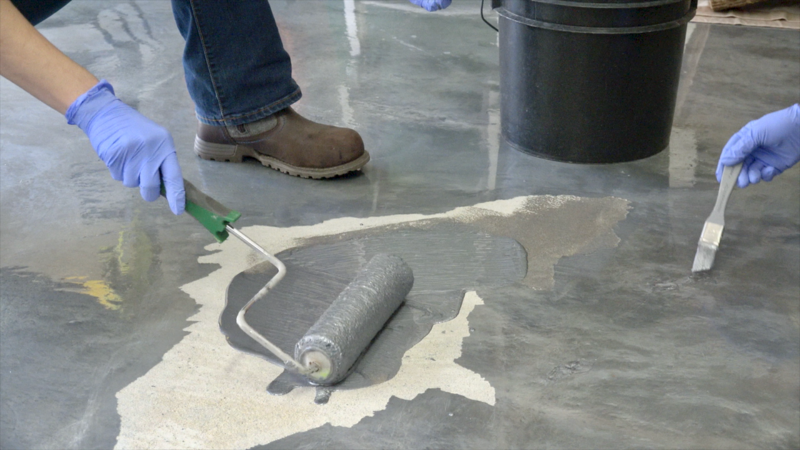 With a little TLC and a RockSolid Polycuramine finish, you can transform your garage floor into a great-looking, highly durable and practical work and storage space.